In the early nineteenth century Ireland’s primitive road network was being greatly expanded and improved. As part of this improvement a direct road from Kenmare to Bantry was proposed. The first official reference to this direct route appears in the report on Public Works in 1833. The desirability of such a road is set out and the distances by the then existing and proposed roads are stated to be 80 miles and 26 miles respectively. 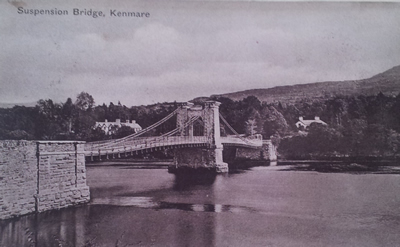 Work on the road began in 1834 and as the work progressed the question of a bridge across the Kenmare River was discussed. The proposal was investigated by one William Bald, F.R.S.E., M.R.I.A. at the expense of the Marquis of Lansdowne who had offered to build at his own expense “a floating chain or fly bridge” over the Sound at a cost no exceeding £1,500. Bald also designed the road from Kenmare to Glengariff. Bald produced several designs for the proposed bridge. The major proposals ranged from multi arched stone bridges through double arched wooden bridges to iron suspension bridges. The Board of Works selected one of the iron suspension designs as being the most appropriate. The estimated cost of such a bridge was £6000. The Board’s choice of bridge did not however meet with universal approval. Isamund Brunel who was the most famous British Engineer of the time and Alexander Gibb who was described as “one of the most skilful and practical bridge builders in the Empire examined both all of the proposed designs. Both of these illustrious gentlemen considered a design consisting of one single arch of wood, one hundred and thirty feet span, and four stone arches each fifty feet span, to be the best available design. The Board of Works however appears to have ignored these criticisms and in the sixth report on Public Works (1839) it is stated that £3,000 had been granted to the Marquis of Lansdowne towards the construction of a Suspension Bridge over the Sound at Kenmare. Lansdowne had earlier offered to contribute £3,000 towards its construction himself. Sir Samuel Brown offered to complete the bridge for £6,150. His tender was only partly successful as the Board of Works decided to construct the tower of suspension and wing walls itself and the contract for the ironwork was given to Sir Samuel. to the rock was as much prized by the Aristocracy of Kenmare as a Coronation ticket-indeed so much so that at one time I thought the cargo would have swamped it altogether. Old Mr. Godfrey, bareheaded, christened and prayed standing upon one rock, whilst I handled the trowel and pronounced an elegant discourse of three sentences on the utility of bridges from another, all of which excited such admiration that even Irish voices were silent and nothing heard but the sound of the waves till all was over. It is fair to assume that there was at least one person in the throng who was not as pleased or excited as the rest. Henry Duckett had been operating a ferry across the Sound and would now be deprived of this source of income. However, he later received some measure of compensation for his loss. In August 1841, he was employed by the Board of Works as a working gangman to “assist in the repair of 3 or 4 miles of the road and prevent damage being done to the bridge when more than usual traffic is expected on it.’, His wages were one shilling per day. The construction of the bridge took approximately one year and was completed in 1841. The total cost was £7,280 of which the Marquis of Lansdowne contributed £3,200. The original decking was of timber but this proved inadequate because of the exposed position of the bridge. Messrs. Westwood of Millwall who installed a system or-inch wrought iron buckled plates 3 feet square replaced the timber in 1861. (Some of these are still to be found in the vicinity of Kenmare). Macadam was placed on the buckled plates to form the road surface. The books show also that Denis Horgan was paid £13-4-8 on 9th feb 1844 for painting the bridge. Westwoods carried out further repairs in 1908. These consisted of strengthening the suspenders and the links with the cross girders, which supported the road surface. Considerable repairs were also necessary to the connection of the main chains to the tower. To strengthen these vital points massive steel plates were built into the top of the tower. The most imposing feature of the bridge was undoubtedly the massive centre tower from which the supporting chains were suspended. This tower designed by a Mr. Barry was thirty-six feet long by twenty-one feet wide at the base and ten feet by seven feet at the top on each side of the roadway arch. It rose to a height of approximately 55 feet above low water. The roadway was eighteen feet wide and narrowed at the archway through the tower to twelve feet. The tower was constructed using entirely local labour from hard grey limestone quarried locally. The effects of traffic far heavier and speedier than was ever contemplated by the original designer took their toll however. A number of the cross girders became badly warped and this caused the lowering of the road level in several places. These depressions were periodically filled and by the time of its demolition nearly 18 inches of stone had been placed on top of the buckle plates at the south end of the bridge. Under traffic of even a very light nature the bridge deck sagged and rose in an alarming manner and gave the impression of being in danger of imminent collapse. In the early 1930’s Professor Pierce Purcell, one of Ireland’s foremost Civil Engineers, was asked by Kerry County Council to investigate the problem of reconditioning or replacing the bridge. It was decided to replace the bridge. Early in 1932 the bridge was declared unsafe and closed to traffic. In March 1932 the demolition of the bridge began with the removal of road metal and railings. A massive wooden frame supported on piles driven from the old decking was used to support the decking while the tower and chains were dismantled. The piles used were of timber obtained locally from a wood belonging to the Marquis of Lansdowne. 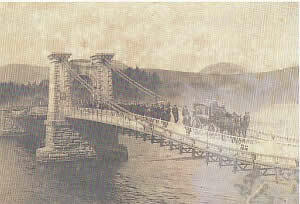 Ireland’s first suspension bridge was disappearing and had only one last function to perform ironically that of a working platform for the construction of its replacement. The wrought iron handrail was manufactured by Shannon Foundry Limited. All sand used for the concrete was brought by rail from the Sutton Sand Company at Newbridge, Co. Kildare. Opening ceremony was performed on March 25, 1933, by Mr Sean T.O’Kelly, Minister for Local Government.